Would you like to spend your car payment on 18 ounces of "Kobe-style" beef? How about $390 for a single Australian Porterhouse steak? A la carte, mind you. All while seated under 2,000 Samurai swords dangling blade-down over your dinner table? Then Kobe Club in mid-town Manhattan is the place for you. This is the latest venture of Jeff Chodorow, better known as the guy with the 9 o'clock shadow bickering with Rocco DiSpirito on the short-lived (but somewhat entertaining) reality show, The Restaurant. Incidentally, this show and the restaurant itself ended with a litigious bang, both parties hobbling off with a little less dignity. Both managed to regain momentum, however, and though Rocco has pretty much stayed away from further restaurant involvement (so as to not become Page Six fodder again, I suspect), he's followed the celebrity chef cookbook and public appearance path. Jeff Chodorow, meanwhile, re-established the bombed restaurant into Caviar & Banana, possibly the worst name for a restaurant ever and equally as unsuccessful as the first. Fast forward to Feb 2007, and Chodorow now has a new bickering buddy. Frank Bruni, esteemed food critic of the New York Times, rated Chodorow's Kobe Club zero stars. Yes, ZERO stars. The review is a pretty entertaining read; what followers of the NYT ratings would call "pure Bruni". I like the "atmosphere" summary: "A dimly lighted theater of about 100 seats that's part samurai fantasia, part torture chamber and packed with chunky guys on expense accounts." Ha! Rate on, Bruni, rate on. In response, Jeff Chodorow took out an $80,000 full-page ad in the Times Dining section, calling the critics unqualified, citing a personal vendetta against him and claiming that the "Rocco's curse" has been the downfall of his post-show ventures. It's essentially 1100 words of a whiny attempt at responsive vitriol, and a overdone declaration of entrance into the blogosphere. Hilarity ensues. Incidentally, Frank Bruni responded via the New York Sun, saying, "None of [my comments] had any personal grudge. The next time he opens a restaurant that seems to be the kind that warrants a look and a review, it will get the same open-minded reaction that any new place gets." Ohhh, snap! Moral of the story: Everybody should create a blog to prove who's balls are bigger. And this is a perfect way to make it back onto Page Six. "We're particularly partial to the lacinato variety of kale. Be aware that lacinato has more aliases than a ganster on the lam." Note the healthy piles of tomato and onion, the substantial shredded cabbage and that lovely white sauce peeking out from under the cabbage. The limes and pickled carrots and peppers complete the plate, rounding out a truly excellent taco experience. One might say that the amount of vegetables is a bit much, but I figure in the case of veggies it's better to load it on and easily pick off yourself than scrimp or not serve at all. Remember, the tacos at Greensboro's Mexico Restaurant were simply scant meat, sad lettuce and drownage of cheese. Once the cheese came off, it was a practically naked tortilla. Speaking of Mexico, the best taco I've ever had was in the tiny town of Ensenada on the Baja Coast. In a dusty street stood this open-air stand surrounded by a diner-style counter. There was an enormous, wok-shaped pot of bubbling frying oil behind the counter, and every few minutes a woman would dip fat strips of fish in a tempura-style batter and drop them one by one into the oil, which crisped and fried to a golden-brown perfection. The tacos were juicy, crispy, and just the right amount of veggies. Even though each was served on standard-sized corn tortillas, they were stacked high, four for five bucks. I (of generally large appetite) barely made it through taco number three before I had to take a slump-in-your-chair-and-hit-your-chest-til-you-burp break. It was that good. As evidenced in previous post, I haven't had a truly good taco in a long, long time. I tried to fulfill my cravings a few nights ago at the most popular Mexican restaurant in Greensboro. It's called Mexico Restaurant. They've been around for 20+ years, and after dinner there the other night, I'm beginning to think they cater to the P.F. Chang's crowd. You know, ethnic food catered to suburban white America. No offense, suburban white Americans. The tacos I ordered from Mexico (the restaurant) were individually wrapped in parchment paper like a to-go burrito. Each one was drowning in pre-shredded white cheese (mozzarella? ), with lettuce as the lonely veg. Being on a dairy-free regiment at the moment, I scraped off the cheese, which left a tiny pile of dry meat and limp lettuce sitting sadly on a huge flour tortilla. If you drew a cartoon of the taco, the meat would have arms in the air as if being pulled into quicksand, and a bubble yelling "Help!". I'd draw the cartoon if I weren't so bad at drawing. I tried to salvage it with salsa from the pre-meal tortillas. The addition of tomatoes made it palatable, but overall a depressing taco experience. Besides the cheese drownage and lack of fresh veg (tomatoes, cilantro, onions and lime come to mind), I have a personal preference for corn tortillas. They are generally smaller (i.e. fit nicely in your hands), thicker, and much tastier in my humble opinion. I mean, a flour tortilla is literally flour and water rolled out into a tasteless disk. I like 'em for bigger stuff (enchiladas, etc), but I want my tacos with corn tortillas, please. 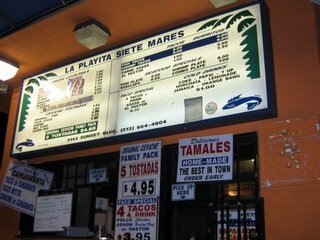 When I think tacos in the States, my mind wanders to El Siete Mares in Silverlake, LA. It's an orange stand (like a mini-drive-thru) with bad parking and a slanted covered patio, right on Sunset Blvd. The food is fresh, the ceviche is satiating, and there's a nice counter on the side with a selection of various homemade salsas and extra veg for your eating pleasures. They serve their tacos with a dab of delicious aioli-like white sauce. Nothing beats a horchata and fish taco for late-night eats. I miss you, Los Angeles. ISO SST (single soft taco). Must love cilantro and lime. Meat/lettuce/tomato proportionate, and no cheese, please. I have a weakness for salsa verde, but I will consider roja, ranchero or pico de gallo. Only corn tortillas need reply. p.s. Prefer roach coach or mini-stand background. Tacos with the last name "Bell": don't even bother.